Please do not message me in game unless you're buying something or making an offer. Post a reply if you have any questions. 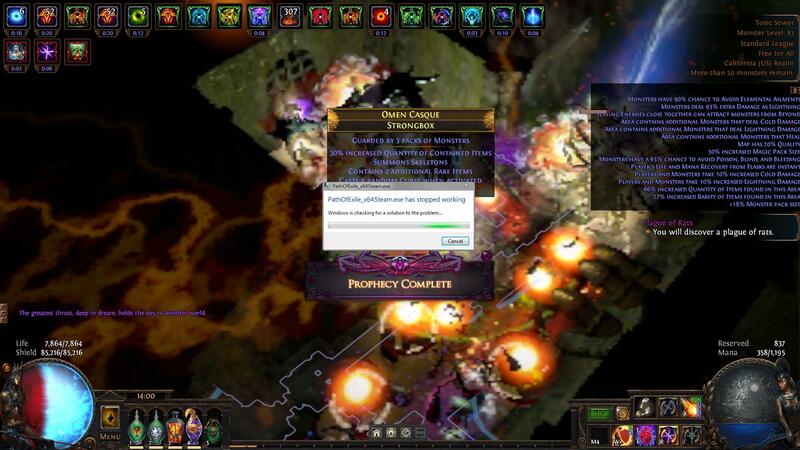 This guide is not for players completely new to Path of Exile. Some knowledge and experience is required. I crash on average twice a map. 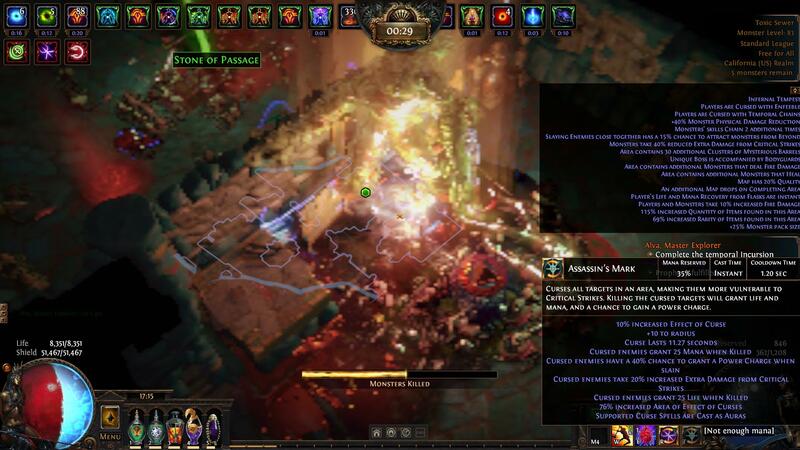 Most of the cost comes from the Headhunter and the weapon, but the build will work without them (build cost 30ex). I have tested a T16 beyond map without a weapon or Headhunter to confirm. Depends on the map layout and what buffs you have. Note: Must be played solo or as carry to get buffs. Everything dies instantly when you have your buffs, so most of the time there will be nothing to deal damage to you. With Temporal Chains @ 50% curse effect, optional Enfeeble, and easy 10k+ EHP, you should rarely die. The only time you could die is before you get life and ES buffs, while amulet swapping (see mechanics section), and when your game crashes. Without any HH buffs, the build has about 4k life with life leech from boot enchant and Atziri's Promise. This build is not, and can not be curse immune. But as mentioned earlier, you should rarely die. From Kaoms's Roots, you have Unwavering Stance, and Cannot be Slowed Below Base Speed. This means you're unaffected by stun, chill, freeze, and most importantly temp chains. The build can chill and freeze enemies, but it's hard to tell with how fast they die. Bosses die instantly in maps, others untested. Based on my character "อีดอกไฟโซฮอท"
Note: This guide does not cover all possible ways to play The Broken Build. It instead focuses on maximum AoE with a spell that has overlapping explosions (Fireball). But once you understand the mechanics, you'll be able to make this build work with any skill and class you want. -The build gets its power from rare monsters you kill and gain mods from, and from souls you gather for Soul Eater. You gain mods from rare monster with both Inspired Learning and Headhunter. Soul Eater is gained reliably from Zerphi's Heart by using a Vaal Skill. The duration of the mods and Soul Eater are 20s and 10s repectively. -To increase this duration and thus the power your build, you reflect Temporal Chains to yourself through Curse on Hit linked in Shackles of the Wretched. The buffs' duration is further increased by having increased Temporal Chains curse effect, or generic curse effect. -Because it requires a lot of investment in curse effect to get enough Temporal Chains effect to cap effects expire slower on you at 75% (150% curse effect? ), this build uses Shaper's presence from Solstice Vigil to cap effects expire slower on you with only ~43% Temporal Chains curse effect. This allows you to build your tree and choose your gear freely as you can reach 41% curse effect with just a helmet enchant and 23% quality Curse on Hit. 45% can be reached with Conqueror's Potency or other means. It is also possible to use Coward's Legacy instead of any curse effect (untested). The 75% slower expiration of effects on you multiplies the duration of effects on you by 4.0 times, which makes Soul Eater last 40s, and Headhunter last 80s. -If your build is not able to curse hexproof enemies, then you'll have to avoid those maps. As Occultist, this isn't an issue. -Since you will be constantly cursed with Temporal Chains which would normally slow your character, Kaom's Roots are used to negate that. -The build gets leech from the boot enchant and Atiziri's Promise. Cinderswallow Urn also helps keep everything topped up. 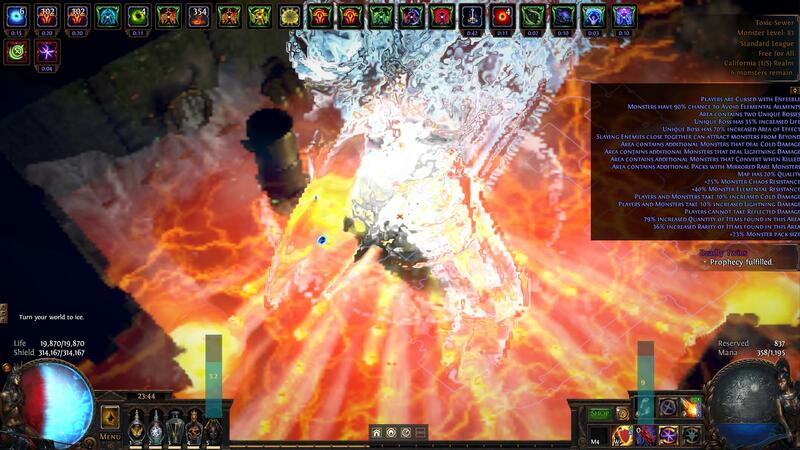 -To maintain the extremely high mana cost while casting 56 times/s (7728 mana/s), Vaal Clarity is used. No other Vaal Skills are used or recommended as they will take souls that you would normally gain for Soul Eater. Note: Soul Ripper can be used to 100% reliably sustain Vaal Clarity, but it's not needed. -Zerphi's Heart's 50% increased attribute requirements do not need to be considered at all except for in the item where Vaal Clarity is linked. Even if every other item becomes unusable when your equip it, you can still gain Soul Eater with Vaal Clarity, then re-equip Solstice Vigil. So I recommend putting your auras with Vaal Clarity if they are still useable. Note: The tree I used in this build has more attributes than needed for Headhunter, but It can use any other belt. If you have a Headhunter, you can save some points on the tree. Rare monsters have three affixes, one of which may be an aura. Based on weightings, it looks like you get 1 Aura (P) and 1P1S. I made that assumption with the modified Solstice Vigil. 1. Run a Beyond Map, Nemesis map, or any map with pack size if those aren't available. IMPORTANT: You may accidently drop your Zerphis's Heart while doing step 5. This has happened to me many times. But with practice, you can do it in 3s without making mistakes. Practice in a safe place. However, I am not responsible for lost or stolen amulets. --E. Move Zerphi's Heart out of your inventory and re-activate Temporal Chains. Sometimes you can re-activate without moving Zerphi's out. Closing and re-opening your inventory also works, and so does doing step F first. 6. Kill things as fast as possible while being near them to gain souls. 7. When your Vaal Clarity runs out after 39.6s, repeat steps 2-5. This build seems to work best in maps with a lot of monster density and a short range of sight like Toxic Sewer or Lair. The density + short range of sight means nearly all your kills will be within Soul Eater range. This allows you to gain souls from every monster you kill. If you decide to use a spell like Fireball which has overlapping explosions, then an indoor map is essential for maximum DPS. Cast at a wall for all of the explosions to overlap. Map: Elemental Reflect. No Leech and No Regen can be challenging, but doable with Cinderswallow. Level as anything else to at least 89, then respec to tree 1b and continue with tree 1a. Main Spell: You can use any spell you want with this build, but it's currently setup for AoE spells and Fireball in this case. Also, you should pick a spell that scales well with lots of cast speed. So no brands, Damage over Time, etc. Physical spells scale best with Headhunter, so I'd suggest those for max DPS. Movement Skill: In the gloves, you can replace faster attack with fortify if you want. You will only be slower at the start of maps, and maybe between Soul Eater buffs. You can also shield charge if you'd like. Curse Auras: Elemental Weakness can be replaced with anything you want such as Enfeeble. Assasin's Mark is required for gaining power charges easily, and it gives a lot of DPS. Weapon CWDT Setup: The 3L Cast When Damage Taken setup in the weapon is optional because of how strong temporal chains is. You can replace it with anything you like. Change the item set based on your budget. All of the items in the Build Mechanics section labelled "Essential Items" are required. Weapon: Look at the item sets for expensive vs budget option. No weapon also works fine. Shield: +1 Gems shield is best for temp chains. Zeel's is used for maximum AoE. Otherwise use any shield or weapon you want. Helmet: Life, resists, other defences, ES. Body Armour: Carcass Jack for max AoE. Otherwise you can use any other armour you want. Gloves: +1 Frenzy implicit gives the most DPS. Otherwise you can use enfeeble or elemental weakness on hit, and drop a curse aura, or use +1 curse amulet. Amulet: +1 curse Solstice with curse on hit gloves is probably best. Rings: Fill resists and get life. Use something like Mark of the Shaper for extra damage if you can. Belt: Headhunter, Coward's Legacy, or Bisco's Leash reccomended, but you can use any belt, or no belt at all. Flasks: Dying Sun and Quicksilver are optional. Jewels: Get the implicit "Corrupted Blood cannot be inflicted on you" on one of the jewels. Use Rolling Flames for max Fireball AoE at range. If you only kill at close range, you can swap them for any other jewels. Helmet: 30% Increased Temporal Chains Curse Effect, or any enchant you want if you already have enough curse effect. Always happy to see wierd out-meta builds! -Added to survivability: Everything dies instantly when you have your buffs, so most of the time there will be nothing to deal damage to you. -Fixed cost: Most of the cost comes from the Headhunter and the weapon, but the build will work without them (build cost 30ex). I have tested a T16 beyond map without a weapon or Headhunter to confirm. -Minor change to How to Play step F: and so does doing step G first. -Changed note before build mechanics section to be more general: But once you understand the mechanics, you'll be able to make this build work with any skill and class you want. -Added to build mechanics: The 75% slower expiration of effects on you multiplies the duration of effects on you by 4.0 times, which makes Soul Eater last 40s, and Headhunter last 80s. Added Bisco's Leash as belt option. Build is tempting.. so so much. But I don't think my comp could handle all the explosions. If you set your graphics and resolution to the lowest, turn on Dynamic Resolution, and set Target Framerate to 60, you should be fine. I found a recent video posted by Empyriangaming that shows what looks like a pure curse effect occultist using Zerphi's Heart and Headhunter. This is a good visual representation of what my build would look like with Winter Orb. Based on the 2nd clip, the soul eater seems to last only 20s, which is 2x longer vs my build's 40s duration. The DPS potential is a lot lower than my build as it doesn't use 3 inspired learning, and requires a lot of investment in curse effect. However, after watching that video, I realized that Brightbeak might be the best choice of weapon since you don't need more damage. I'll add it to the video section of my thread.